It’s just past 11pm on a Thursday night when a pair of men walk into 91 Clinton St. 11 months out of the year, the Lower East Side storefront is home to New York Sushi Ko; at the start of August, Mayanoki, New York’s first and only sustainable omakase pop-up, moved in. Clad in an SF Giants baseball cap, the sushi chef reaches over the bar to serve Massachusetts scallops to a group of women as he asks them about Bonnaroo while Florence and the Machine plays in the background. He offers to serve the new guests sushi a la carte (“just tell me when to stop”) as they’ve missed the last 9pm omakase seating. Lured in by the recently torched, Spanish mackerel with fresh yuzukoshō (not a bright orange salmon slab so iconic to New York's sushi haunts) they stay, lucky to grab a spot at the previously sold-out eight-seat sushi counter for the nightly rounds of $125 omakase. 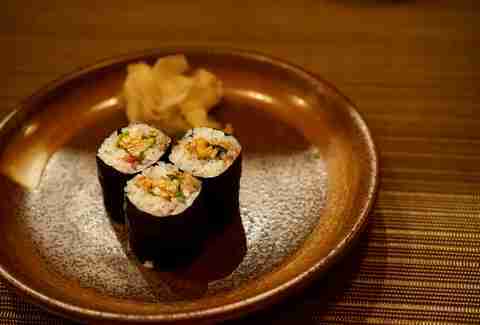 For years, Mayanoki was the only place in New York where you could dine on sustainable sushi. This past April, Chisai Sushi Bar opened in Crown Heights, offering fast-casual sustainable sushi (including a $7 California roll using local crab and a line-caught yellowfish scallion roll), but Mayanoki still remains as NYC’s only sustainable omakase spot. For the uninitiated, sustainable sushi is created when a seafood menu takes into account government regulations, environmental suggestions, and seasonality, reducing the negative impacts overfishing and misuse of seafood can have on the environment. While many upscale New York sushi restaurants emphasize importing fish from Japan, this is not the most sustainable or environmentally responsible way to consume sushi en masse. Tuna is direly overfished, and salmon is often farm-raised in harsh conditions, using antibiotics, hormones, and pesticides not exactly fit for human consumption. Concerns about mercury and higher concentrations of PCP in larger fish are reason enough to make you second-guess that $9.99 special of three spicy tuna rolls you get for lunch every week. Mayanoki (a name Torchiano and co-founder Josh Arak came up with one night while under the influence of, well, something) officially started in 2012, when the duo wanted to find a space for restaurant-less sushi chef Albert Tse, a skilled sushi master they met circa 2005 at TriBeCa’s Zutto. The fanboys wanted Tse to keep up his sushi momentum, and decided to build a pop-up just for him. Tse would eventually leave the project, but that wasn't the end for Mayanoki or its mission to get New Yorkers to care about where their fish comes from. The first shrines to Tse’s sushi skills started at Arak and Torchiano’s apartments in Union Square and Astoria, where 12 people crowded in to get a taste of Tse’s sushi expertise. “We thought that if we could get 12 people at our apartments, we can get them at some other place,” Torchiano says. After practically endless cold-calling in search of the perfect, affordable space to host dinners (New York apartment hunters can relate), in September 2013, Mayanoki landed at Brooklyn Oenology, a winery and tasting room in Williamsburg, where they would pop up twice every other week with an omakase menu. The Brooklyn Oenology partnership was in place for two years until Tse left the project due to its demanding schedule. “It was 14 hours a day for the chef: He had to receive the products, break [the fish] down and he couldn’t commit the time and energy to the enterprise and eventually left,” Torchiano says. 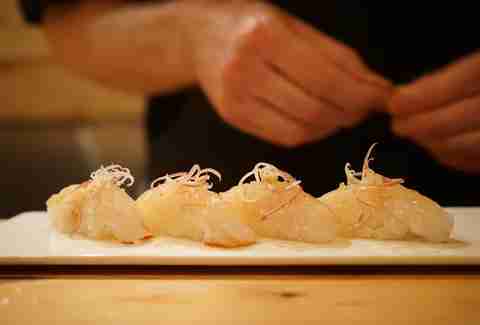 Without a chef, Mayanoki took a temporary hiatus in June 2015. Things turned around this past spring, though, when a New York real estate fantasy came to life: Mayanoki was offered a sublet. John Daly, the chef-owner of New York Sushi Ko, reached out to Mayanoki to see if they wanted to use his restaurant for the month of August, when business was slow because New Yorkers were out of the city. Daly decided to spend the month out East, and Mayanoki moved in. The style of pop-ups themselves are inherently full of sustainable benefits: Mayanoki uses New York Sushi Ko’s refrigerators and equipment, and, of course, keeps the space productive during an otherwise empty time. The Sushi Ko invitation further helped Mayanoki expand its underlying mission with a new chef that Daly also helped bring in: Jeff Miller, whom he’d previously met filming a segment for Munchies and wanted for his own restaurant. Miller was responsible for purchasing fish at Uchi in Texas, and already had a sustainable focus, so he was the right fit. Miller never planned to be a sushi chef. “I’d be running a sustainable copy shop pop-up now, if everything had gone right,” the tall chef in a SF Giants cap joked to an enthralled sushi counter audience. While studying journalism at the University of Florida, Miller walked into local sushi restaurant Dragonfly, and was immediately mistaken for one of the owner’s friends. Without a formal interview, he was hired to work the sushi counter on the spot and immediately quit his other college job working at a local copy shop. After graduating with a degree in journalism, the California native decided to pursue sushi full-time. Miller packed up to move to New York to spearhead Mayanoki just weeks before the summer pop-up re-opened. Shiny, silver-skinned fish are in season in August, and Miller has added them to his menu, along with local fluke, Massachusetts scallops, and other East Coast seafood. To break up the 12- to 15-course tasting (it’s easy to lose count), he also serves sushi, like a double-egg roll featuring both salmon roe and and a chewy tamago omelet, as well as a seared-to-order trumpet mushroom sprinkled with just enough sea salt to almost pass as a chewy, umami-packed slice of fish. Creating a sustainable seafood menu requires flexibility, and Torchiano believes this is one of the main reasons New York is pretty much bereft of sustainable sushi spots. “Our biggest challenge is overcoming the preconceptions people have about what they want and what is good for them,” Torchiano says. 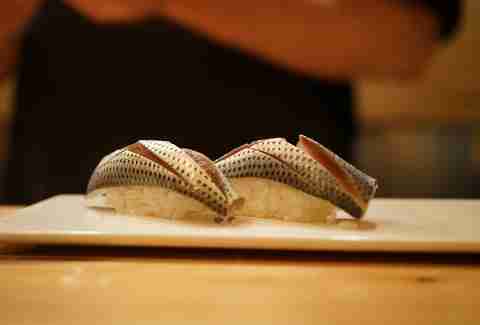 The pop-up sources fish caught in New Jersey and Massachusetts the day before, and partners with purveyors who work directly with individually owned boats and fishermen; in contrast, many New York sushi restaurants fly in their fish from Japan. “Most places aren’t willing to take on the risk of buying lionfish or surf clam and making that a central part of the menu,” Torchaino says. 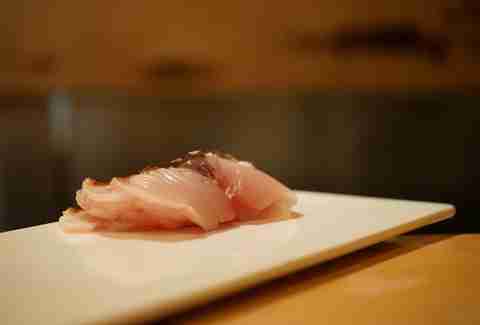 Though high-end places may have more rarely seen fish, they’re certainly not highlighted on the menu above bluefin toro. The lack of sustainable sushi in New York City is a twofold problem: “Restaurants don’t go out of their way and buy things that they don’t think they’re going to sell, and people don’t know to ask for it,” Torchiano explains. Mayanoki is changing that. 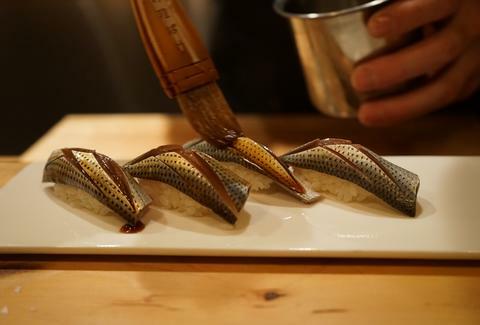 After the team eliminated printed menus (because customers started picking out certain dishes in the omakase they knew they wouldn’t like), diners started getting more adventurous and enjoying new fish without being too scrupulous. “We’ve never had one complaint about the quality of fish or the quality of the meal,” Torchiano says. Right now, a meal at Mayanoki will open you up to the likes of porgy with shiso and lemon zest, raw sea bass, Duxbury oyster with shiso and ikura, and Long Island fluke with white ponzu and chives. Those with an endless appetite can opt to try their favorite piece again -- Arctic char is a fan favorite -- or continue munching a la carte until their sustainable sushi glut is satisfied. As for what comes next, Mayanoki is still working on details on their next round of pop-ups, but they promise to hold more events in the city, and perhaps even open in a permanent space. For now, reservations can be made at Mayanoki.com. “We have one shot to prove to people that sustainable sushi is not just a good idea, but a delicious idea,” Torchiano says. Melissa Kravitz is a writer based in NYC. She really loves sushi. Follow her at @melissabethk.